Are Omega’s 6s Healthy or Unhealthy? We recently documented the health benefits of eating sufficient omega-3 fatty acids. Oftentimes, researchers discuss omega-3 fatty acids in the context of their counterpart omega-6 fatty acids. News outlets such as authority nutrition state that eating too many omega-6 fatty acids causes health problems ranging from inflammation to heart disease. Additionally, others tout the importance of eating a proper ratio of omega-6/omega-3 fatty acids. But what is the real story behind this controversial fatty acid? And is there any credibility in eating the proper ratio? Below, we discuss the science behind this molecule, its impact on your health, and how you much you should truly be eating. Omega-6 fatty acids, like their “sister” molecule omega-3 fatty acids, are a polyunsaturated fat. This means that they consist of a three-carbon molecule called glycerol attached to three chains of carbon and hydrogen atoms called fatty acids. Because they are polyunsaturated, at least one of these three fatty acid chains has more than one double bond between carbon atoms. In contrast, monounsaturated fats only contain one double bond between carbon atoms in their fatty acid chains and saturated fats contain no double bonds between the carbon atoms in the fatty acid chain. Its sister omega-3 fatty acid molecule, alpha-linoleic acid (ALA), is nearly identical to LA but also contains a double bond between the 3rd and 4th carbon atoms from the right. The second, called gamma-linolenic acid (GA), is nearly identical to LA but also contains an additional double bond between the 12th and 13th carbon atoms from the right. It can be obtained from certain foods directly or converted from LA. The third omega-6 fatty acid, called arachidonic acid (AA), contains 20 carbon atoms. It contains a total of four carbon-carbon double bonds. Like LA, the first one is between the 6th and 7th carbon atoms in the chain from the right and the second is between the 9th and 10th carbon atoms from the right. The other two double bonds are between the 12th and 13th carbon atoms and the 15th and 16th carbon atoms. Omega-3 fatty acids and omega-6 fatty acids are typically referred to as essential fatty acids. This means that the body needs these molecules for critical cellular and bodily functions but cannot produce them. Thus, humans have to eat foods or supplements to get both. Thankfully, many dietary sources contain LA. Much of the GLA taken in supplement form is first converted to a molecule called DLGA before it exerts its effects. Consuming nutrients such as zinc, vitamins C, B3, and B6, and magnesium promote the conversion of GLA to DGLA. While this research is promising, more rigorous research needs to be done to support the clinical benefits of GLA. In contrast, omega-3 fatty acids typically affect the body in different ways. 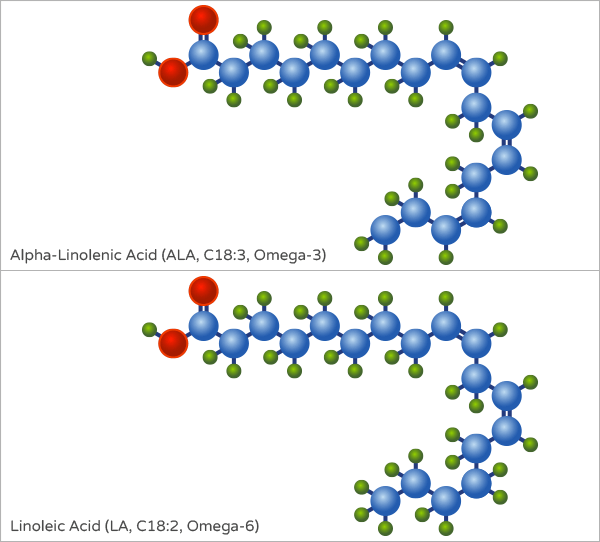 Below we explain the relationship between these two essential fatty acids. 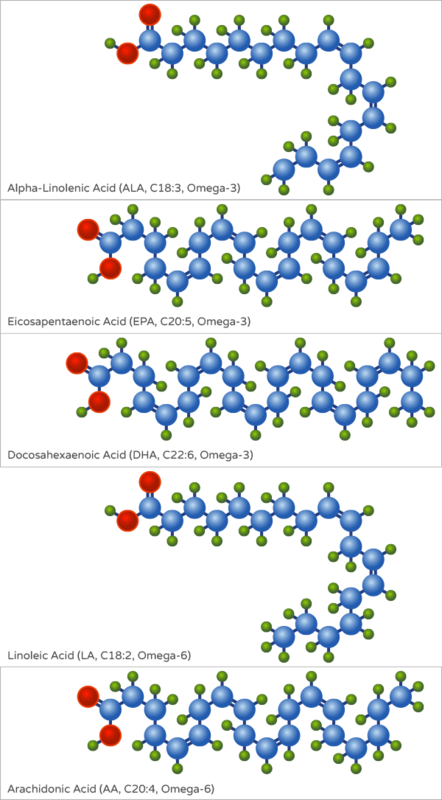 So, how exactly do omega-3s and omega-6s interact? First, we need to quickly review some biology. Enzymes are large molecules (usually protein) that speed up a specific reaction. To do this, they bind to a specific molecule called a substrate and chemically modify it to the desired product. An enzyme’s substrate is typically one specific molecule or a group of chemically similar molecules. However, because both molecules compete for the same enzymes, high levels of omega-6 fatty acids may undo some of the health benefits of omega-3 fatty acids. Some researchers believe that this promotes inflammation and restriction of blood vessels, thus negatively affecting the body. Additionally, both fatty acids affect regulate genes differently and are incorporated into cellular membranes. This further suggests that having a good omega-6 to omega-3 ratio is critical to optimal health. This problem is compounded by the fact people following a “western diet”, or one high in processed meats and vegetable oils, typically get a lot more omega-6 fatty acids than omega-3 fatty acids. In the past 50 years, the amount of omega-6 fatty acids in body fat stores in Americans has increased from 7% to 23% – over a three-fold increase. [10, 11] Americans also consume more omega-3 fatty acids than they used to. Given the increased prevalence of chronic conditions and diseases such as obesity, diabetes, cardiovascular disease, and depression, researchers have been curious to assess if increased omega-6 fatty acid consumption is culpable. But is there any clinical significance to the increased omega-3/omega-6 ratio? Or is the evidence weak and overhyped? We present the evidence below. The Great Debate: Is the Omega-3/Omega-6 Ratio Important? According to other research, a ratio below 5:1 had beneficial effects on symptoms related to colorectal cancer and asthma, and a ratio below 3:1 reduced inflammation in individuals suffering from rheumatoid arthritis. Researchers of a 2006 meta-analysis focused on unearthing a potential association between omega-6 fatty acid consumption and cardiovascular illness. In it, they examined data from seven randomized trials that included that included 11,275 subjects. A handful of research indicates that a lower omega-6/omega-3 ratio benefits the body. Because omega-6 fatty acids are sometimes pro-inflammatory, researchers provided 22 subjects with 4 weeks of a traditional Swedish diet lower in omega-3 fatty acids and then a traditional Mediterranean diet higher in omega-3 fatty acids. Key Takeaways: A reasonable amount of research indicates that a lower ratio of omega-6/omega-3 fatty acids (6:1 and lower) in the blood may help lower the risk of complications related to the cardiovascular and immune systems. Putting it in Perspective: How much does the Omega-6/Omega-3 Ratio Really Matter? A reasonable amount of evidence suggests that while it is important to eat a proper amount of omega-3 and omega-6 fatty acids, the actual ratio between the two of them isn’t the greatest indicator of your risk of developing certain chronic conditions. In the previously mentioned study conducted by Wijendran et. al, researchers suggested that an ideal ratio of omega-6s to omega-3s is 6:1. This supports the notion that while the omega-6/omega-3 ratio is something important to monitor, it is more critical to get the proper amount of each essential fatty acid in your diet. Another study also indicates that eating the proper amount of omega-6 and omega-3 fatty acids is more important than getting the correct ratio. In a randomized, parallel trial lasting 6 months, researchers recruited 258 subjects aged 45-70 years without any notable diseases. They then provided them with a diet consisting of 6% energy from the essential fatty acids but with a different ratio between them. The first group ate an omega-6 to omega-3 fatty acid ratio of 3:1, the second 4:1, the third 5:1, and the fourth 10:1. After measuring insulin sensitivity and the activity of lipid enzymes, two indicators of cardiovascular and hormonal health, the researchers concluded that “decreasing the n-6:n-3 does not influence insulin sensitivity or lipase activities in older subjects.”  They noted that the increased intake of omega-3 fatty acids led to favorable changes in LDL particle size. They then remarked that “to reduce omega-6 PUFA intakes from their current levels would be more likely to increase than to decrease risk for CHD.”  Thus, consuming an adequate amount of omega-6 fatty acids is also important. Key Takeaways: Some research indicates that the omega-6/omega-3 ratio is a weak indicator or overall health. Additionally, this research emphasizes that it’s important the people consume the recommended daily amount of omega-3 and omega-6 fatty acids than fixating on the precise ratio between the two. How Much Should You Truly Be Getting? The research on the importance of omega-6/omega-3 fatty acid ratio is mixed. Some high-quality studies and analyses suggest that a higher ratio (above 10:1) may increase the risk of developing negative health conditions related to heart health and inflammation. The best way to get your servings of omega-3 fatty acids is to eat two 3 ounce servings of fatty fish such as mackerel, sardines, and salmon per week. It is also important to note that some foods high in omega-6 fatty acids, such as walnuts and Brazilian nuts, are also high in omega-3 fatty acids and have other nutritional benefits. More research needs to be done to show the clinical significance of omega-6 fatty acids and the omega-6 to omega-3 ratio. But for now, science shows that it’s more important you get the proper amount of omega-3 fatty acids and omega-6 fatty acids from nutrient-rich sources such as nuts, dairy, and lean meats. Chow, Ching Kuang, ed. Fatty acids in foods and their health implications. CRC Press, 2007. Ullmann, Fritz, and Barbara Elvers. Encyclopedia of industrial chemistry. VCH, 1991. Whitney Ellie and Rolfes SR (2008). Understanding Nutrition (11th ed.). California: Thomson Wadsworth. p. 154. “Nutrient Data Laboratory Home Page”. USDA National Nutrient Database for Standard Reference, Release 20. U.S. Department of Agriculture, Agricultural Research Service. 2007. Flider, Frank J (May 2005). “GLA: Uses and New Sources” (PDF). INFORM 16 (5): 279–282. Li, Duo, et al. “Contribution of meat fat to dietary arachidonic acid.” Lipids33.4 (1998): 437-440. Harris, William S., et al. “Omega-6 fatty acids and risk for cardiovascular disease a science advisory from the American Heart Association Nutrition Subcommittee of the Council on Nutrition, Physical Activity, and Metabolism; Council on Cardiovascular Nursing; and Council on Epidemiology and Prevention.” Circulation 119.6 (2009): 902-907. YungSheng, Huang, and David E. Mills. γ-Linolenic acid: metabolism and its role in nutrition and medicine. AOCS Press, 1995. Scorletti, E., and Christopher D. Byrne. “Omega-3 fatty acids, hepatic lipid metabolism, and nonalcoholic fatty liver disease.” Annual review of nutrition33 (2013): 231-248. Ren, Jimin, et al. “Composition of adipose tissue and marrow fat in humans by 1H NMR at 7 Tesla.” Journal of lipid research 49.9 (2008): 2055-2062. Berry, Elliot M., et al. 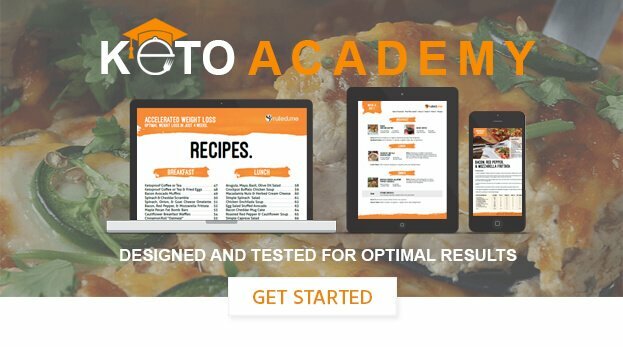 “The relationship of dietary fat to plasma lipid levels as studied by factor analysis of adipose tissue fatty acid composition in a free-living population of middle-aged American men.” The American journal of clinical nutrition 44.2 (1986): 220-231. Blasbalg, Tanya L., et al. “Changes in consumption of omega-3 and omega-6 fatty acids in the United States during the 20th century.” The American journal of clinical nutrition 93.5 (2011): 950-962.
de Lorgeril, M., Renaud, S., Mamelle, N., Salen, P., Martin, J.-L., Monjaud, I., Guidollet, J., Touboul, P., Delaye, J. (1994). Mediterranean alpha-linolenic acid-rich diet in secondary prevention of coronary heart disease. Lancet 343:1454–1459. Ramsden, Christopher E., et al. “n-6 fatty acid-specific and mixed polyunsaturated dietary interventions have different effects on CHD risk: a meta-analysis of randomised controlled trials.” British Journal of Nutrition104.11 (2010): 1586-1600. Lands, William EM. “Dietary fat and health: the evidence and the politics of prevention: careful use of dietary fats can improve life and prevent disease.” Annals of the New York Academy of Sciences 1055.1 (2005): 179-192. Wijendran, Vasuki, and K. C. Hayes. “Dietary n-6 and n-3 fatty acid balance and cardiovascular health.” Annu. Rev. Nutr. 24 (2004): 597-615. Ambring, Anneli, et al. “Mediterranean-inspired diet lowers the ratio of serum phospholipid n− 6 to n− 3 fatty acids, the number of leukocytes and platelets, and vascular endothelial growth factor in healthy subjects.” The American journal of clinical nutrition 83.3 (2006): 575-581. Bjørkkjær, Tormod, et al. “Short-term duodenal seal oil administration normalised n-6 to n-3 fatty acid ratio in rectal mucosa and ameliorated bodily pain in patients with inflammatory bowel disease.” Lipids in health and disease 5.1 (2006): 1. Weiss, Lauren A., Elizabeth Barrett-Connor, and Denise von Mühlen. “Ratio of n− 6 to n− 3 fatty acids and bone mineral density in older adults: the Rancho Bernardo Study.” The American journal of clinical nutrition 81.4 (2005): 934-938. Griffin, Margaret D., et al. “Effects of altering the ratio of dietary n− 6 to n− 3 fatty acids on insulin sensitivity, lipoprotein size, and postprandial lipemia in men and postmenopausal women aged 45–70 y: the OPTILIP Study.” The American journal of clinical nutrition 84.6 (2006): 1290-1298. Sanders, Thomas AB, et al. “Effect of varying the ratio of n− 6 to n− 3 fatty acids by increasing the dietary intake of α-linolenic acid, eicosapentaenoic and docosahexaenoic acid, or both on fibrinogen and clotting factors VII and XII in persons aged 45–70 y: the OPTILIP Study.” The American journal of clinical nutrition 84.3 (2006): 513-522.